YAY! It's FRIDAY!!! Sorry for the impromptu break, my laptop had a major crash this week. I just got it back. So I have a quick card to share. I used Scrapmaster's Paradise & Company's Certified Awesome stamp again but this time I just used a little banner and phrase. I love how versatile this stamp set is. I paired it with some patterned paper's from Echo Park's For the Record 2 by Lori Whitlock. Love these! 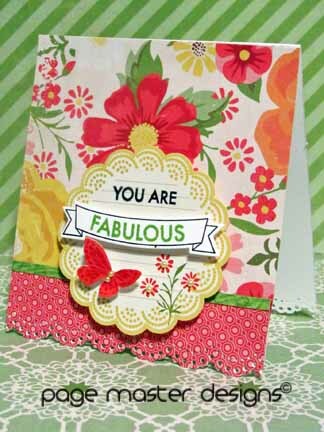 I should be receiving my first kit from Scrapmaster's Paradise this weekend and I am hoping to have a fun layout to share with you too. If you have a love of Echo Park you should really check out these kits and her stamps. It just fantastic!!! There are so many great things on the horizon over there! Wow, I just love this!!! That little butterfly is just the perfect touch!! !